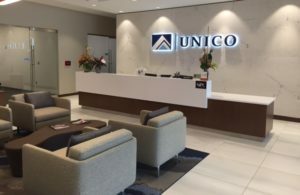 UNICO Group, Inc., came into existence October 1, 1988, as the result of a merger between two well-established property/casualty insurance brokerage firms—Reynolds-Simmons-Nelson Insurance and Chambers Dobson. Chambers Dobson also included a financial services division led by Rich Hill. The merger of the firms was a direct response to the belief that by merging the individuals and talents of both firms, a new corporation would be created that could build upon and even exceed the past precedents established by the two individual firms for services and professionalism. In the initial endeavor to expand, UNICO Group of Columbus was opened in 1998 under the leadership of Bob Wick with the objective of increasing our customer base in northeastern Nebraska. In January 1999, UNICO responded to the demands of our clients by adding a Life Department, UNICO Financial Advisors. Our growth continued in western Nebraska. In May 2001, Anderson-Divan-Cottrell Insurance merged with UNICO Group, Inc. forming UNICO Group of Kearney. In March of 2009, UNICO completed its merger with Greco Insurance Agency of Papillion, which allowed us to grow in the Omaha metro area. Tom Greco and his father Mike have been in the agency business for more than 20 years. UNICO Group, Inc., officially merged with Midlands Financial in October 2014. This monumental alliance allowed each company to grow in the areas of risk management, employee benefits, and financial services. Today, we are proud to serve the Midwest with four locations and more than 100 team members across seven states. Midlands Financial, a leading benefits/financial services provider established in 1969, adds great value to the financial team and collaboratively operates under the updated UNICO Group brand. Midlands also leads our employee benefits charge as Midlands Financial, a division of UNICO. Collectively, our team of experts now offers comprehensive personal and business solutions across more sectors than ever before. UNICO Group, Inc., is the largest locally owned insurance agency in Lincoln and one of the largest in Nebraska.